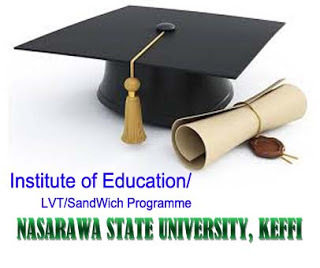 This is to inform interested applicants into Nasarawa State University Keffi Institute of Education/LVT/SandWich Programme about the commencement of sales of forms into various postgraduate programs for the 2016/2017 academic session. This the first step of the application process. At this point you will be required to create a school account where you fill the necessary details as may be required.Biodata/Profile, Academic Qualifications, SSCE Details. At the end of the application, we will print Application payment invoice which you will take to the bank for payment. The application form is N5,500 only. Application forms would be purchased at the cost of N5,300 in the following banks. The nest step is to visit the above mentioned bank with the paymetn invoice we issued you, to purchase the application form at the rate of N5, 300. After payment is made, You will be given a print out alongside a copy of your payment teller . Please, keep this because you will be required to use the confirmation order on the print out for your online application. Return to us at the business center to comfirm payment. Your payment will be verified and will print your application receipt with your “Applicant ID” alongside Application Summary. Please note that you have to quote the “Applicant ID” in all future correspondence with the Institute of Education in regards to your admission. “The Director, Institute of Education, P.M.B. 1022, Keffi, Nasarawa State”. The envelope containing these items should have “LVT 2015 ADMISSION FORM” written at the top left hand corner.